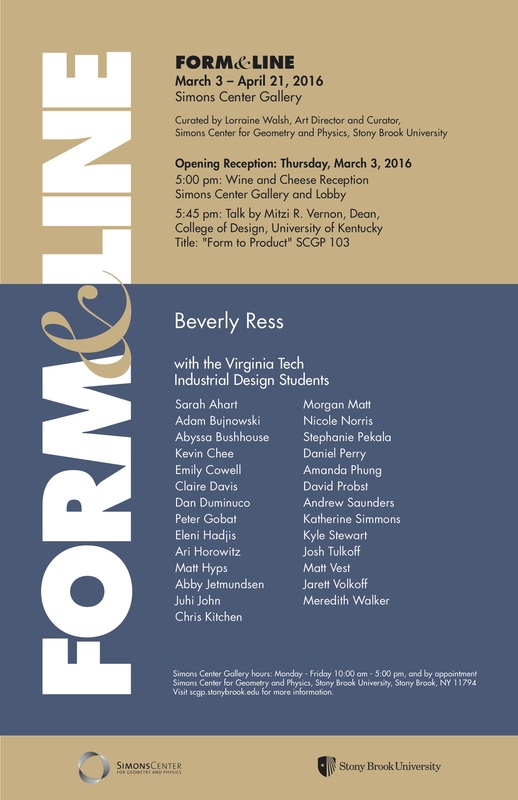 The exhibition Form & Line features the work of artist Beverly Ress alongside the nascent products by Virginia Tech Industrial Design students. Dissimilar in concept and outcome, their paired artwork provides uncanny affinities. Ress’s beautiful inquiry of natural forms, including universal shapes such as the torus, Klein bottle and Möbius strip, and the student’s exploration of line, volume, and planar analysis, exquisitely discover form and line anew. Beverly Ress’s recent solo exhibitions of her drawings include The Katzen Museum, Washington, DC and The Kentler International Drawing Space, Brooklyn, New York, NY. Her work is often featured in National Drawing Invitationals in venues such as the Weatherspoon Art Museum and the Arkansas Arts Center. Ress’s group exhibits include Schema Projects, Brooklyn; Chroma Gallery, Charlottesville, VA and the Maryland Institute College of Art, Baltimore, among many others. For the past several years, Ress has worked with museum collections, making carefully observed drawings of specimens during artist-in-residencies at the National Museum of Natural History, the National Museum of Health and Medicine, the Mammalian Brain Lab at George Washington University, and at the Mutter Museum. She combines ideas in science and art in pursuit of a delicately structured contemporary memento mori. The Virginia Tech Industrial Design students are participants in a larger group traveling exhibition titled FORM | Line-Plane-Solid, which examines the critical role of ‘form’ in product design. The exhibit features 200+ projects from an undergraduate course called Form Studio. The exhibit story centers on a core concept, ‘form-matrix,’ which includes 6 divisions of form and how they intersect: 3 modes–Line, Plane, and Solid and 3 behavioral genres—Flow (fluid), Tecto (tectonic), and Roto (rotational). The projects span 6 different form exercises (linear flowform; planar flowform; solid flowform; planar tectoform, solid tectoform, rotoform) and 4 different form products (platter; hand tool; vessel; citrus juicer). Special thanks to Mitzi R. Vernon, Dean, College of Design, University of Kentucky; CIDER, The Center for Instructional Development and Educational Research at Virginia Tech, and the DC Commission on the Arts and Humanities, Washington DC.